You can specify the shape, size, and number of legs for your robotic creature, using intuitive editing tools to interactively explore design alternatives. The system takes over much of the non-intuitive and tedious task of planning the motion of the robot, and ensures that your design is capable of moving the way you want and not fall down. Or you can alter your creature’s gait as desired. The research team presented the system at SIGGRAPH Asia 2015, the ACM Conference on Computer Graphics and Interactive Techniques, in Kobe, Japan. The design interface features two viewports: one that lets you edit the robot’s structure and motion and a second that displays how those changes would likely alter the robot’s behavior. You can load an initial, skeletal description of the robot and the system then creates an initial geometry and places a motor at each joint position. You can then edit the robot’s structure, adding or removing motors, or adjust their position and orientation. The researchers have developed an efficient optimization method that uses an approximate dynamics model to generate stable walking motions for robots with varying numbers of legs. In contrast to conventional methods that can require several minutes of computation time to generate motions, the process takes just a few seconds, enhancing the interactive nature of the design tool. Once the design process is complete, the system automatically generates 3-D geometry for all body parts, including connectors for the motors, which can then be sent to a 3-D printer for fabrication. The research team also included roboticists at ETH Zurich. 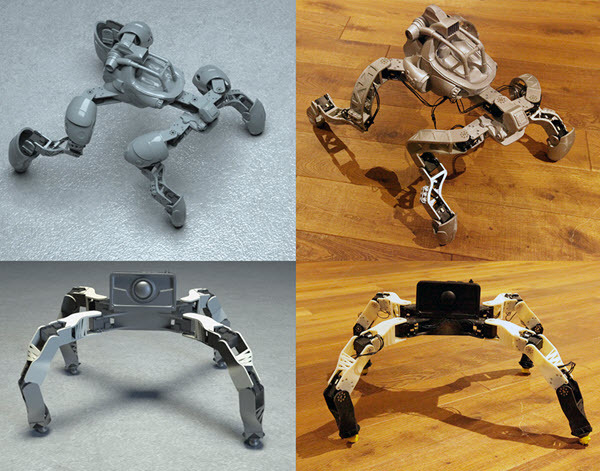 For more information, see Interactive Design of 3D-Printable Robotic Creatures (open access) and visit the project website.